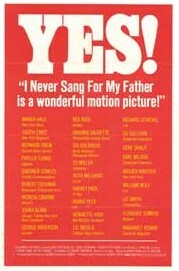 I Never Sang for My Father is a 1970 American drama film based on a 1968 play of the same name, which tells the story of a widowed college professor who wants to get out from under the thumb of his aging father yet still has regrets about his plan to leave him behind when he remarries and moves to California. It stars Melvyn Douglas, Gene Hackman, Dorothy Stickney, Estelle Parsons, and Elizabeth Hubbard. The film was directed and produced by Gilbert Cates, and adapted by Robert Anderson from his 1968 Broadway play. It was nominated for Academy Awards for Best Actor in a Leading Role (Melvyn Douglas), Best Actor in a Supporting Role (Gene Hackman), and Best Writing, Screenplay Based on Material from Another Medium (Robert Anderson). Gene Garrison is picking up his parents at the airport. He drives them home and spends the evening with them. The barbs of his father, Tom, run through his mind as he drives home. Gene seeks solace in the arms of his mistress, who pines for a more serious relationship with him. Soon after, his mother, Margaret, suffers a heart attack and is hospitalized. Gene visits her at the hospital. He finds his father pacing in the waiting room. Tom asks Gene to go to the Rotary Club with him, though Gene was expecting not to leave his mother's side. When Margaret dies, he helps his father shop for a casket. His sister, Alice, arrives without her husband and kids. She explains to Gene that Tom's failing memory and health will require constant care either in a nursing home or with live-in assistance. She broaches the idea with their father who rejects it outright. The conversation brings up old tensions about his disinheritance of Alice over her choice of a Jewish spouse. Alice leaves Gene to deal with their father by himself. Gene's girlfriend Peggy arrives for a visit. She is charmed by Tom and offers to relocate to New York to live with Gene and his father. That night, Gene and his father reminisce together over old photographs. Tom's love for his son comes shining through in their conversation, and he asks about a tune that Gene used to sing for him as a boy. Gene confesses that he never sang the tune for his father, but Tom recalls otherwise. Gene tells Tom that he is thinking about moving to California to be with Peggy, where she has a successful gynecological practice. Tom becomes irate at the notion, feeling abandoned. Gene leaves the house with Peggy and never comes back. Director Gilbert Cates had been one of the producers of the original stage play. The play was profiled in the William Goldman book The Season: A Candid Look at Broadway. The film was shot in various locations, including Southern California and the Great Neck - Douglaston area of New York. Applauded by critics and viewers, the film (and play) predicted the coming of the sandwich generation, in this case, grown children and other family members helping their elderly parents who are up in age and can't help themselves. It would lead to other films on the subject, including the movies The Savages and Away from Her. Roger Ebert summarized the film in his review before concluding, "These bare bones of plot hardly give any hint of the power of this film. I've suggested something of what it's about, but almost nothing about the way the writing, the direction, and the performances come together to create one of the most unforgettably human films I can remember." Vincent Canby, in his review for The New York Times, was far less complimentary: "(The film) does the human spirit a disservice in the way it pleads for sympathy for people who are small and flat, like comic strip characters, without sweetness, without imagination, without any suspected reserves of emotion. Indeed, it almost becomes ridiculous when you realize that it is without any honest problem, either psychological or economic." ^ Ebert, Roger. "I Never Sang for My Father". January 1, 1970. ^ Canby, Vincent (October 19, 1970). "Cates's Film, 'I Never Sang for My Father,' Begins Run". The New York Times. Retrieved November 15, 2018.